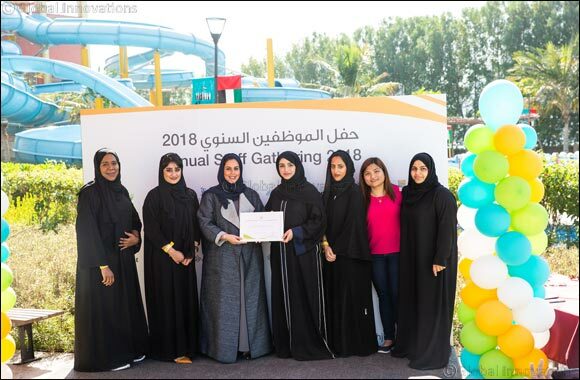 Sharjah Ladies Club (SLC) recently organized its annual staff gathering to celebrate the achievements made and milestones reached during 2018 at a vibrant, informal atmosphere at Al Montazah Parks, where employees enjoyed a full day of revelries packed with fun and games, team building activities, awards and recognitions. Team building activities and water sports, at the waterpark was also organised exclusively for the ladies. The SLC awarding ceremony, which recognises the proactive efforts, creativity and outstanding contributions of employees from the Club’s various departments, was one of the main highlights of the event. Through the 21 award categories, including outstanding employees from different departments for their endless achievements and superb teamwork,and a special recognition award is dedicated to 9 staff members which showed initiative, dedication and loyalty throughout this year , chosen from the Club’s 400 workforce – SLC furthers the spirit of healthy competition and boosts employee morale. Addressing the staff, Khawla Al Serkal, Director General of SLC, said: “The staff of an organisation represents its lifeblood – this is the belief we here at SLC uphold. 2018 was a tremendously successful year for the club, which saw a substantial growth in our family of happy clientele. We also successfully launched new services and updated and modernised existing ones. None of this would have been possible without a single one of our big family. Our continued success is a reflection of their sincerity and professionalism. In fact, the team handled the challenges faced during 2018 professionally which made them stronger. The purpose of this gathering is to further strengthen the bonds of our staff. We wish to welcome 2019 with achievements and success as we aim to focus on setting strategies, employee and overall performance development. Established in 1982, SLC - a subsidiary of the Supreme Council for Family Affairs - is dedicated to facilitating leisure and educational activities for women and children. The facility provides its members with a relaxing and nurturing space where they can learn, enjoy sports and partake in their favourite hobbies. SLC organises events that relate to society, art, health and charity, with activities including bazaars, exhibitions, sporting events, seminars, workshops and forums. Designed to be a unique leisure and learning space, SLC boasts an array of world-class facilities and offers numerous high-end services, making it one of the best-of-its-kind facilities in the Middle East.